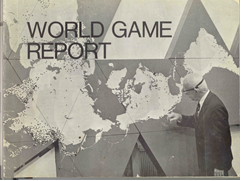 The World Game Report (1969) shows Buckminster Fuller before a map he designed to eliminate distortion and represent an accurate global scale. Designed for “intelligent amateurs”, the game sought a logistically reorganized use of the world’s resources. He introduced a progressive wave metaphor where each wave would create a layer of improved performance per unit of invested time and energy. The knowledge of how every component function within the global schedule has continuously improved, perhaps beyond Fuller’s expectation, but not his vision. Global economists since Thomas Malthus and Adam Smith have defined human relations as “trade”. The wonderful thing about Fuller is how he knew to offer a view that creates change through design using “scale” to produce balance and proportion. Applied to a map, a nation, a city or neighborhood the scale offers a direct route success.There is much more on Bucky by the Buckminster Fuller Institute.